Two South Bay school districts might feel the financial pain if the Chargers move up North, according to The Star News. The Sweetwater Union High School District estimates that their schools have received close to $500,000 in funding from the San Diego Chargers, including for facilities and wellness programs. The Chula Vista Elementary School also says their contributions from the Chargers might go away if they leave up North. The Chula Vista City Council voted unanimously to transfer the Olympic Training Center to Chula Vista in 2017. The switch will cost the City approximately $4 million per year. Councilwoman Patricia Aguilar called the overwhelming praise for the transfer a “love fest,” before asking several pointed questions, mostly directed at the third-party Point Loma Trust, which will become the third-party operator. U.S. Olympic Committee (USOC) has promised to pay $3 million per year for four years for use of the facilities. The City must come up with the rest of the approximately $8 million in expenses. While public speakers and most councilmembers hailed the move, the website Focus on Chula Vista is more skeptical. In particular, some argue that the reason why the USOC wanted out is precisely because the center never achieved its desired potential as a tourist hot spot. That means, it might become a money-sink for CV. In addition to indefinitely postponing the election (originally scheduled for February 9; postponed by the board majority to February 23; postponed by the same board majority to March 8; and now postponed indefinitely), the current board majority on the Eastlake III HOA board decided to lower homeowners’ HOA association dues by $2 per month.Everyone likes to have more money in their pockets, but here’s why we consider the board’s action to be reckless and fiscally irresponsible. There are 3,133 homes in Eastlake III. Lowering the dues by $2 per month takes $6,266 per month ($75,192 per year) out of the association’s operating budget. That means the association will have $75,000 less per year to maintain Eastlake III’s facilities (pools, clubhouses, weight room, landscaping, etc.) and provide the community events to which we have been accustomed. The current board majority made this decision even though they haven’t formally reviewed the association’s budget in approximately 18 months. They also made this decision even though in less than six months, they’ve spent nearly $50,000 for attorney’s fees–approximately TEN TIMES the $5,000 annual budget for attorney’s fees. What that means is that the board has already created a significant budgetary shortfall by spending huge amounts on attorney’s fees. Christine Huard at the Union Tribune reports that Southwestern Community College has been placed on warning status by the Accrediting Commission for Community and Junior Colleges for failing to meet standards. The San Diego Reader reports the same. Meanwhile, CBS8 reported that construction is underway for a Wellness and Aquatic Center at the community college. The $52 million project is funded by Proposition R, which voters approved as part of a $389 million general obligation bond. Hey, didn’t they just build a massive stadium as well? Huard also tweeted real time while attending the San Ysidro School Board meeting. All eyes continued to be on trustees in the struggling district. The most important topic regarded a reconfiguration of schools. Shamed former Superintendent Manuel Paul, who spent time in jail, had shuffled school grades in an odd way during this tenure. Some schools were oddly K-3, while others were K-8, for example. Teachers and administrators were left confused, frustrated and felt it hindered teaching. Discussion of a charter school also came up with President of the Board, Antonio Martinez saying he wouldn’t support it because the district has unionized teachers. Sirhan Sirhan lives here, right in Otay Mesa. Specifically at the Richard J. Donovan Correctional Facility where he was moved about 2 1/2 years ago. This week, we was denied parole for killing the Presidential Candidate in 1968, just a few days after the candidate visited San Ysidro. National City’s Council vs. Chamber Rift? National City’s Chamber of Commerce came out with their newsletter that shows a very vibrant area on the cusp of a tourism boom, artist-urban living and more. Their beer house, Machete’s, also celebrates their 1 year anniversary. Mayor Ron Morrison continues to announce infrastructure upgrades in the city. Their port is set to get a 4,700 square foot Aquatic Center. And don’t forget the Mariachi Festival & Competition is becoming nationally renown. Interestingly, this week their newsletter also linked to a Union-Tribune article “Pot shops can revitalize areas, analysts say.” This comes after the National City Council voted against medicinal marijuana shops several weeks back. May there be a subtle little rift between the Chamber and the City on this issue? Lincoln Acres, an unincorporated community lying next to National City, took up the issue of Border Patrol recruiting at the Lincoln High School job fair. Students at the majority-Latino school were unhappy about the agency recruiting in their midst. Our very own Doug Porter who publishesThe Starting Line explains. Sandra Dibble at the Union Tribune reports that the peso has lost more than 20% of its value to the dollar over the last year. 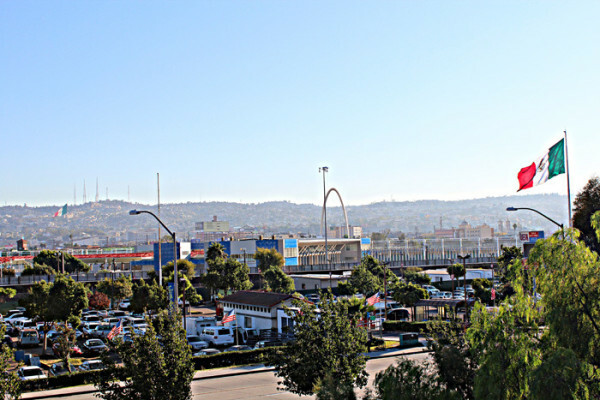 As a consequence, Tijuana residents are struggling. The San Ysidro Chamber of Commerce notes the same in their newsletters — their small businesses have been affected. Borderland Beat talks about “Cities of Crystal” — and yes, they’re talking about San Diego & Tijuana. Marty Graham at The San Diego Reader reports that razor wire was recently installed along the border from Imperial Beach to San Ysidro. The addition has cut traumatic injuries to fence-jumpers and has reduced the need for border patrol agents to be stationed at hospitals where illegal immigrants receive treatment. Our Frank Gormlie at the OB Rag has been following this story too and he has a different report than KPBS. Our Starting Line reporter, Doug Porter, had even more to report yesterday morning. The upshot: the California Coastal Commission sacked the executive director because the board wanted someone more developer-friendly. Imperial Beach Mayor, Serge Dedina, weighed in to support the director, but to no avail. A free concert is planned on Wednesday, February 24, at 6 p.m. “Sene Africa,” at the South Chula Vista Branch Library (389 Orange Avenue) in honor of Black History Month. Ibrahim Ba and Amadou Fall will perform music from Senegal.And the border is going inland! The University of San Diego’s Joan B. Kroc School of Peace Studies presents the tenth annual Border Film Week from Tuesday, February 23 to Thursday, February 25th. I would think that installation of razor wire would increase traumatic injuries not cut them. C’mon, John; can you say deterrent?